The Santa Monica Mountains are one mass of rock, thrust up and eroded above ground, deeply rooted, impervious below. At their westernmost end, the Santa Monica Mountains scrape straight up from the Pacific, Highway 1 precariously strapped to their sides. Like the abyssal batholith of the Sierra, except on a smaller scale, these mountains are one mass of rock, thrust up and eroded above ground, deeply rooted, impervious below. Water does not flow past them. At their eastern end the mountains seem to get smaller, shrink down to hills at Griffith Park, but in fact the ridge has sounded, diving underground. Bedrock lies only forty feet below the surface. Say you are water. From mountains’ ridgelines, you flow down. From the San Gabriels, by which you were raked by snow from winter storms, from the Santa Susanas and the Verdugo Hills as spring rain, you flow southwards, toward the sea. You erode and carry stone. You rush down. When you emerge from steep canyons, you lose your carrying power, leaving your offerings of boulders and other large stones at the feet of the mountain slopes, sweeping sand, clay, and silts farther along. All the waters moving among the sediments of the San Fernando Valley floor come up against the mass of the semi-submerged Santa Monicas and are pushed upward to the surface, begin to move with greater force. Those waters are the Los Angeles River. When they come to the end of the bedrock that holds them from their progress toward the sea, they curve around it, moving faster. Concrete cannot hold this upwelling. Almost every late 20th century newspaper article you might read about the river refers to its use as a Hollywood movie set, but what is used in that way is not the river itself but the container made for it. Many other nouns used in place of the river—“sewer,” “sea of cement,” “storm drain”—also refer to this container. Writers who speak of the river being “crammed into a cement suit,” or “corseted,” separate the river waters from the structures of their containment, but don’t seem to agree about the river’s gender. Engineers from the Army Corps contemplate their final solution in 1948. Courtesy of the Los Angeles Public Library. The more articles you read, the more you would learn about encounters in earlier centuries between humans and the river: how the Franciscans were fooled into establishing their mission next to what were placid, wide waters in the late summer of 1769; how Californios naively followed suit and built their pueblo near the riverbank two years later. The Anglo Angelenos grew tired of replacing their washed-out bridges; how Progressive Era believers in the social benefits of parklands hired the sons of Frederick Law Olmstead in the 1930s to create a plan for seventy thousand acres of open space along the river. That plan was ditched after floods killed 130 people. You would read about the “final solution”—a loaded term for containment in the late 1930s—to enclose the waters in concrete. A photograph from 1948 shows businessmen with white shirtsleeves rolled up, ties dangling as they lean over what are called “models of proposed channel improvement.” In another photo, huge bulldozers diminish the men. Behind them, a channel is cut in sand for the river that, despite the conversion it is even at that moment undergoing, is flowing on in its own way. 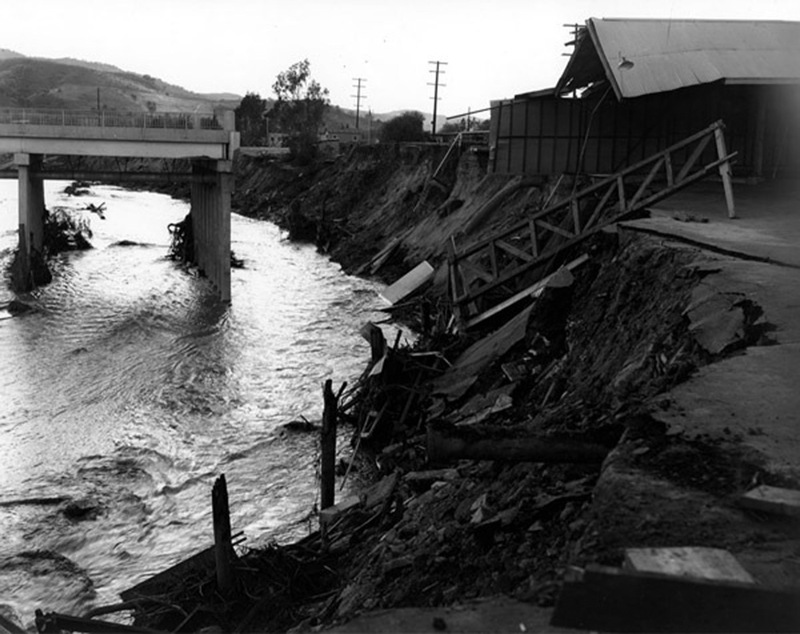 A Studio City bridge washed out by the 1938 floods. Courtesy of the USC Digital Library. Along the three-mile reach called the Glendale Narrows that curves around the base of Griffith Park, where the waters come to the corner of the Santa Monican bedrock, the river is uncontainable. While walls were built to direct the river’s path, the waters come up through the sand and silt, cobble and gravel with such force that they displace any cement suit they might be corseted in. Accounts agree that the Army Corps of Engineers went on enclosing the river and its above-ground tributaries in concrete through the 1960s and that even as the Corps built, runoff from development in the San Fernando Valley—paving, roadbuilding, homebuilding, freeway-raising—outstripped the system’s carrying capacity by twenty-five percent. To keep up with the river they created, the Corps began to develop plans to raise the walls higher to contain it. When the rains returned at the end of the drought of the 1990s, waters raged through the channels at 35 miles per hour; storm drains backed up, trapping motorists; lives were lost. In 1996, a writer at the London Guardian, who has the river beginning in the San Gabriel mountains on the east side of the basin (the hydrological story) and emerging 20 miles away on the west side, in Canoga Park (the Corps’ story), tells a made-for-TV-drama story about a maintenance worker helicoptered out of the riverbed when a raging torrent spawned by heavy rains deluged the cab of his machine. In 1997, Canadian and Australian newspapers picked up a story of three teenagers who were drowned when an Alhambra box culvert was filled by a wall of water that started as a downpour miles away, but they mis-locate where that rain fell; neither those lost local kids nor the far-flung journalists were able to parse the illegible scrawl of culverts and channels through which the waters move. 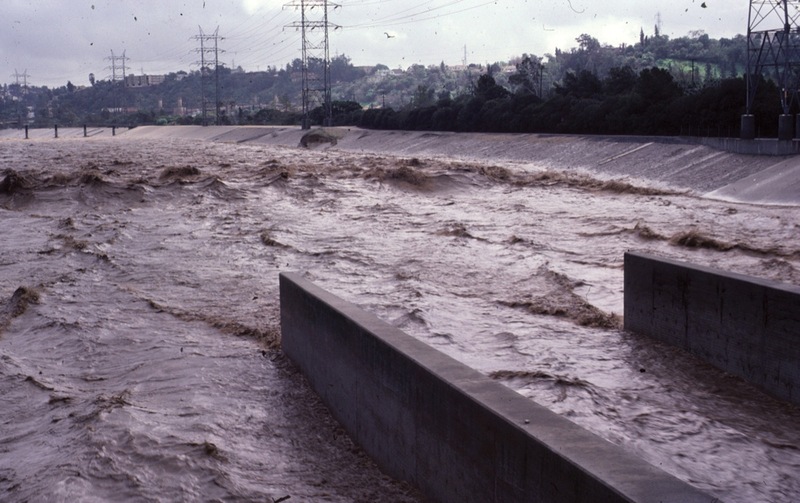 Floodwaters rushing along the Narrows southward under the Los Feliz Bridge in 1978. Courtesy of the Clarence Inman Collection. And water was rising elsewhere. State Supreme Court Justice Broussard had declared in 1983 that the value of diverting Mono Lake’s water to thirsty Los Angeles was to be balanced with the lake’s environmental and recreational value. The net result: LADWP was required to take less water in order to allow the depleted lake to rise again. Some people began to think of all that water in the culverts as running wasted into the sea; others, inspired by the Mono Lake success story, began to think of the river. Still others, people whose property would be damaged should the structure fail, supported plans to strengthen it and approved of the bulldozers that regularly cleared the channel of the vegetation that made for habitat. In a flush economy, voters with money in their pockets passed a park bond. A state with a surplus in its coffers established a new park on former railyards adjacent to the river. More money went to converting more sides of the waterway into bike paths. The City of Los Angeles hired a Pasadena consulting firm to develop a plan to revitalize the river. That plan became part of the city’s Master Plan in 2007. All the money spent on planning ran wasted into the sea in 2008, when the economy tanked. Meet the river. Stand on one of those paved paths, shaded by the Hyperion Bridge arching over the Narrows where, in the uncorseted river below, an egret stalks in reeds growing between cobbles. You might talk to a cyclist who brings his bike on the back of his car from Mt. Washington to ride from Los Feliz to Burbank and back. To get to the bike path he drives the freeway that follows a boxed-in tributary to the river, Arroyo Seco Creek, named for the canyon it flows through.. He does not live next to the river, which is dry most of the time. He cannot ride next to the creek from his home to the river because the confluence is buried beneath the freeway junction. He takes off in his neon gear, shoulders up, head down. 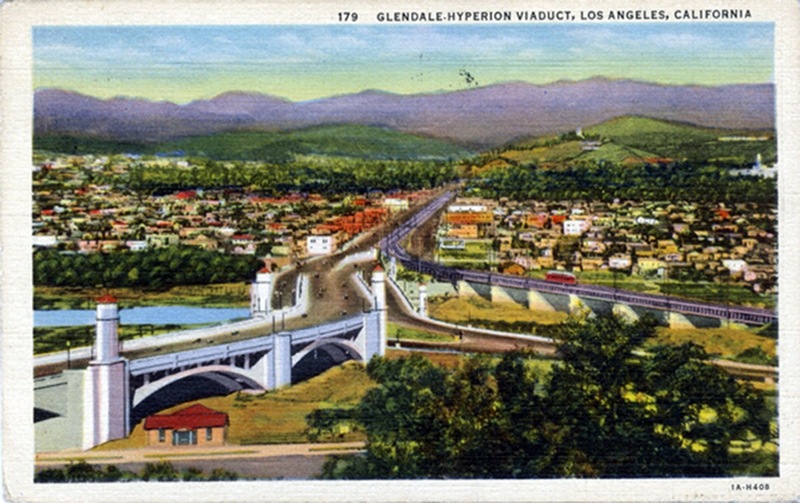 The river is scenic under the Glendale-Hyperion Bridge in this 1939 postcard but is quietly disappeared from the scene as it heads south toward downtown Los Angeles. Were you to talk to folks up and down the river, their stories might seem to add up to a class divide: People who can afford to recreate in and along the river want it to have water in it. People who live downriver, who can’t afford increased flood insurance costs, don’t. This could just as well look like an upstream-downstream divergence. If you consulted other experts, however, you would hear other stories: of upstream Asians and Latinos of lower economic standing supporting the greening of the river, of river advocates seeking environmental justice for those low income people pushed to the edge. Were you to walk where cyclists ride, you would see vacant warehouses, weedy triangles of lot ends, buckling parking lots, sycamores in rectangles of dirt, back fences of backyards of houses. Through some of those fences, you might see vegetable gardens, dark citrus and saw-leaved loquat trees, unraveling lawn chairs, pinwheels. Over the rush of the freeway, you might hear train bells, rumbling of engines, the clatter of coupling. You might hear the people who live in the tight-packed houses that back up to the Narrows express fears that increasing access makes their homes more vulnerable to crime. The Santa Monica Mountains Conservancy has converted a few of the weedy, asphalted lot ends into pocket parks. The newer ones seem as much parodies of parks as the river does of itself. 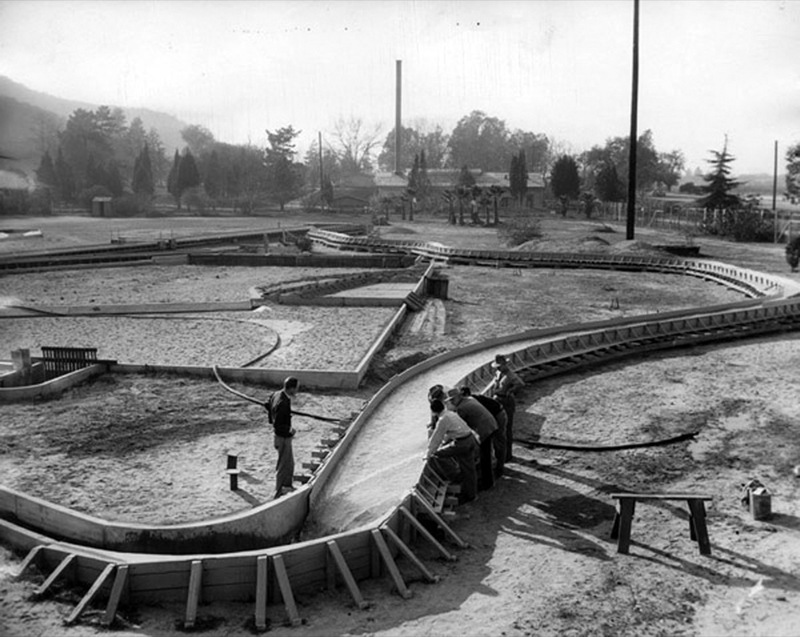 The “Steelhead Park” is comprised of a series of concrete terraces planted with native shrubs and a fence embellished with metal fish cutouts. The plants are overpowered by the concrete poured to contain them. However, in another park, saplings have grown high enough to create inviting shade. Two paths diverge. On the lower, two homeless men sit on a bench. They might offer a welcome. Most of the time, the water will flow placid in the channel below. Between the two parks, where the engineers decided the river bottom could be covered again, where the Glendale Narrows comes to its end, the river, quiet in summer, noses at the rough, broken concrete triangles tilting above the flow, oblique peaks around which the water creases. On one of these, someone has spray-painted “BURIED IN A CONCRETE,” and on another, the eroded word “COFFIN” is split into its syllables. The force of the river wrenched the concrete in two. On a third slab, dragged by those same waters even further away over the cracked concrete bed, the imperative “BREAK AWAY” is nearly rubbed out. The river’s way of commenting on its container. In July 2010, the Environmental Protection Agency declared the river navigable. This releases it from the control of the Army Corps of Engineers and puts its waters under the protection of Federal Clean Water Act. The following summer, a limited number of people received weekend permits to paddle a short stretch of the river. The 280 spots sold out in ten minutes. Back in the 1920s, wilderness lovers protested LADWP’s plans to take water from the Eastern Sierra streams that fed Mono Lake. The Water Commission of the time, even acknowledging the harm the diversions would cause, followed state policy that use of water for domestic purposes was the “highest use.” Since Justice Broussard’s 1983 landmark decision, environmental and recreational uses must be balanced with domestic and commercial. Arguing against the railroad, the river advocates appropriate the very term that has justified a century of environmental harm. Conflicting agendas swirl and eddy. Union Pacific asserts it will continue to use the rail yard. An LA City Council member describes the potential transformation as “converting dead space into something that’s lucrative.” The site may be environmentally compromised and perhaps recreationally useless, but it is not economically dead. The transfer of goods is as essential to California’s vitality as water is its lifeblood. And its river neighbor is not merely the “product” the revitalization designers have come up with. In their progress from headwaters to the sea, its waters drop further in elevation, in one-fortieth of the distance, than the Mississippi. When in flood, they move with four times the force. The Narrows is a good place to visit, because it’s where the irrepressible river insists on emerging. Water will come out of the sky (we hope). It will gather on the ridgelines and flow into the canyons. It will flow around obstacles in soft creases or in a muddy torrent. We can direct it or make room for it. The issue is perhaps not whether soccer balls or shipping containers or birders or cyclists will circulate along the river banks, but how to take those insistent waters into account.